All of our whiskeys and infused moonshines are made of 100% natural ingredients right from the grains to the fruits, coffee beans and teas. The base spirits are produced in-house and distilled in our 200-gallon pot still. . Straw Hat Corn Whiskey Moonshine is the base spirit formulation of all our product line up. We start out with locally grown South Carolina corn and wheat. The flavor is rounded out with malted barley. All of the ingredients are mashed together, fermented and distilled in our single pot distillation method. It’s old time corn whiskey made with modern equipment. Straw Hat Lemon Drop Moonshine starts out with our moonshine combined fresh squeezed lemon juice and sweetened with pure cane sugar. Lemon Drop is the perfect balance of lemony sourness and sweet, finishing with the smoothness of moonshine made from South Carolina corn. Cool off with a refreshing treat on the rocks or combined with your favorite fruit juice mixers on a long hot summer's day. Straw Hat Blueberry Moonshine starts out with our moonshine combined wild blueberry juice and sweetened with pure cane sugar. It reminds us of fresh blueberry muffins. Top it off with fresh whipped cream and turn it into a blueberry pie shot. Straw Hat Blackberry Blast Moonshine will remind you of what it's like walking through a country field, finding that perfectly plump ripe blackberry and enjoying its freshness right off the vine. Like all our fruit flavored moonshines it starts out with our moonshine and is combined with the freshest juiced blackberries and sweetened with pure cane sugar. We are sure you'll enjoy this well balanced delicacy of summer's bounty. Straw Hat Hair of the Moon Coffee Moonshine starts out with our moonshine used to extract the natural flavor of high quality roasted whole bean coffee ground to our specification. Our Coffee Moonshine has the perfect taste of coffee with just the right amount of rich sweetness and finishes with a hint of natural vanilla bean. Use this in your favorite coffee liquor cocktail recipe or enjoy like you would an iced coffee. Made with Starbucks coffee beans. Straw Hat Apple Pie Moonshine is made from apple cider straight from the press in the fall when the apples are coming off the trees. Once we get the cider back to the distillery we formulate the seasons batch on the spot. Sweetened with cane sugar with a touch of cinnamon. It doesn't have to be fall to enjoy the this seasonal treat year round - while supplies last of course. Straw Hat Rum is made from fermented and distilled pure distillers grade molasses. Hint of the base ferment comes through in the finished spirit making it a full flavored silver rum. Great in your favorite recipes calling for rum and the best rum and Coke we've ever had. Look for barrel aged rum in the future at the distillery. 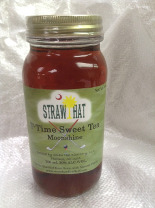 Straw Hat T-Time Sweet Tea Moonshine is not for folks who order their tea unsweetened. We brew our tea in house and sweeten it like it's supposed to be. Enough said. 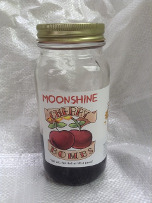 Straw Hat Cherry Bombs Moonshine are like no other out there. Bottled with dark sweet cherries, tart cheery juice and high proof moonshine makes the perfect cherry fizz when added to a tall glass of Sprite and ice. Then plop a few cherries on top for a garnish. Save the "bombs" for last to finish off your cocktail experience. Straw Hat Limoncello was inspired by some our Italian friends that showed us it's not all about just the Lemon Drop. 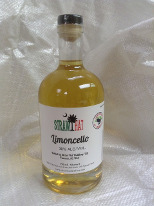 Our Limoncello is a close cousin however. Our lemons are zested to extract the lemony flavor that gives this cordial a thumbs up when finishing that huge meal. 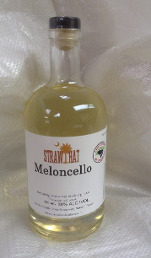 Straw Hat Meloncello - we didn't even see it coming. Fresh, ripened cantaloupe steeped in our moonshine makes this delictible treat worth trying. The perfect level of sweetness brings out the melon flavor that will bring you back to the old country. Try mixing with cream 50/50 for a summer hit. Of course our bottles stay in the freezer ready to go.